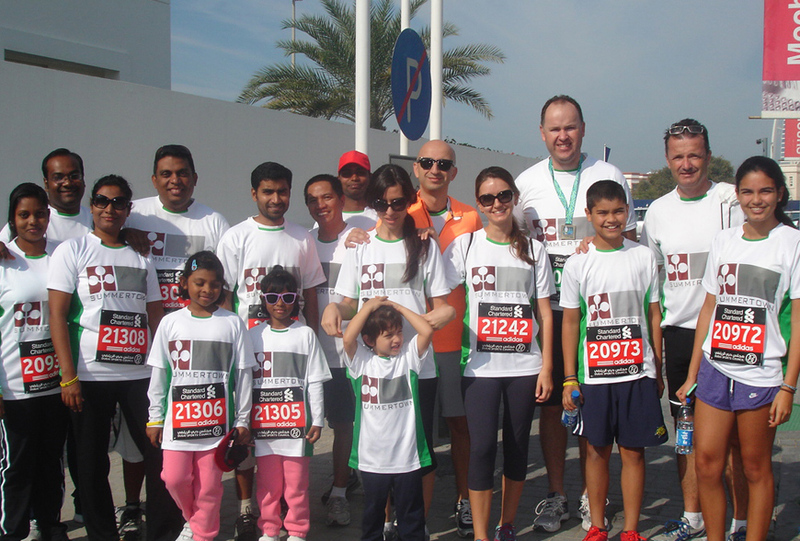 The Summertown team were geared up for the big race on Friday 24th January at the Dubai Standard Chartered 10km run and 3km fun run, with a total of 40 staff members and their families participating. Team leaders, Esra Kayhan, Summertown’s HR Manager and Managing Director Marcos Bish ensured that the teams were prepared ahead of the race, encouraging staff to train for the event, and helping everyone to increase their fitness levels. Five runners took part in the 10km run, whilst the 3km fun run saw staff with family members taking part, with the youngest runner being just 4 years old. The Standard Chartered run is one of a series of events that is spearheaded by Esra under Summertown’s Corporate Social Responsibility directive to boost health and wellbeing amongst its employees. In addition to promoting fitness initiatives, Summertown’s CSR activities have included an eco tour of the Eastern Mangroves in Abu Dhabi, and initiatives to promote healthy eating habits in the workplace. Summertown’s donations will be going to Mawaheb by the Beautiful People – a local art studio for young adults with special needs.